Are your heating bills through the roof? Are you struggling to keep your house cool in the summer? This might be due to insufficient insulation. When we don’t insulate our homes properly, we find that drafts can get into the house in the winter, and air-conditioned air escapes in the summer. To prevent this, using spray foam around the home will create a more energy efficient haven. This will cut down your energy bills while putting you one step closer to being an eco-warrior! 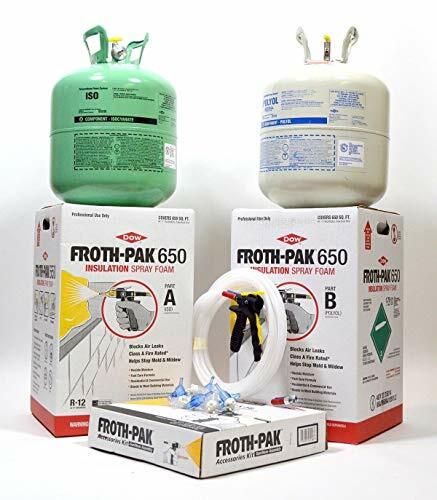 If you’re wondering what kind of spray foam insulation you need or how to choose between the available products, check out our guide below. Made from the chemical components ‘isocyanate’ and ‘polyol resin’, spray foam occurs when these two things react together. It causes the chemicals to mix together and expand by up to 60 times its original size. Because this foam increases into such a large size very quickly, it is the ideal insulator as it can be sprayed into nooks and crannies, filling them to prevent air loss. This is why spray foam is used as an insulation device. 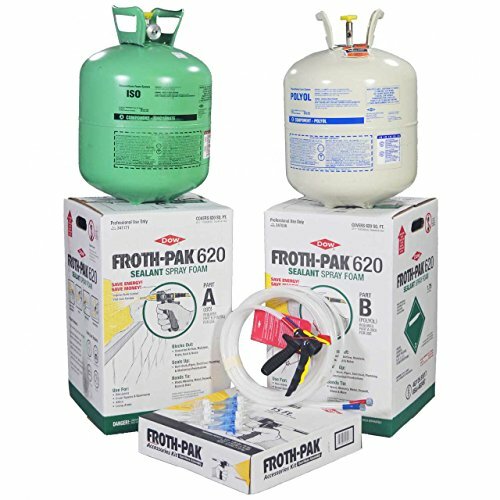 There are two main forms of spray foam: open-cell and closed-cell. The first option is very good at absorbing sound and is often used in soundproofing. The second version has a much higher density, which makes it great for insulating against heat loss. This product has actually been used on military aircraft since its invention in the 1940s. However, it wasn’t utilized as an insulating agent for heat retention until the 1970s. Since then, it has become a very popular choice for people trying to seal up their homes for more efficient heating. A very versatile insulator, spray foam has a whole host of applications within the home. 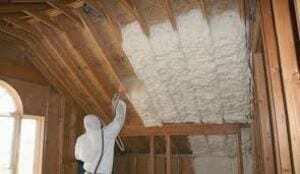 Firstly, people use spray foam in the attic or loft as heat rises. The rising heat is often lost through the roofs of our houses, or through our chimney stacks. By spraying foam into the cracks and around the edges of the attic, we find that the heat is kept in more securely. This can reduce heat loss between 30 and 50% in the home. Spray foam is widely used inside walls to help keep them insulated. By spraying foam into the walls of a home, this can insulate up to 300 times as more than a wall on its own. The spray foam widens significantly to fill the gap. Either open or closed cell spray foam can be employed in this case. The ceilings of garages are very rarely insulated. As garages are rather drafty, we end up losing a lot of heat through the garage. This heat rises in the garage, usually escaping through the garage ceiling. Employing spray foam up in the upper recesses of the garage ceiling and in any associated crawl spaces will help to insulate the room and in turn, the house. 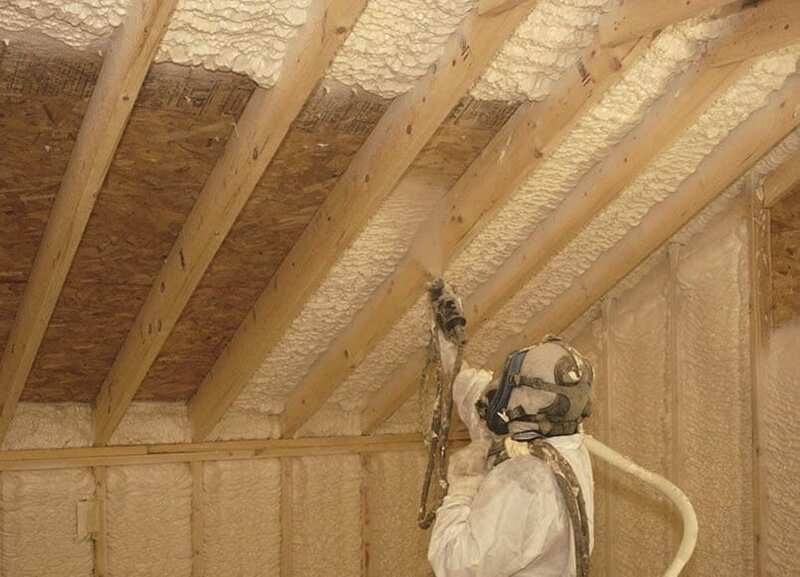 When we use open-cell spray foam in our walls, attic, or in the ceiling, we also add soundproofing. For people in duplexes or adjoined housing, this can work very effectively to keep out the sounds of noisy neighbors while also keeping the house nice and warm. 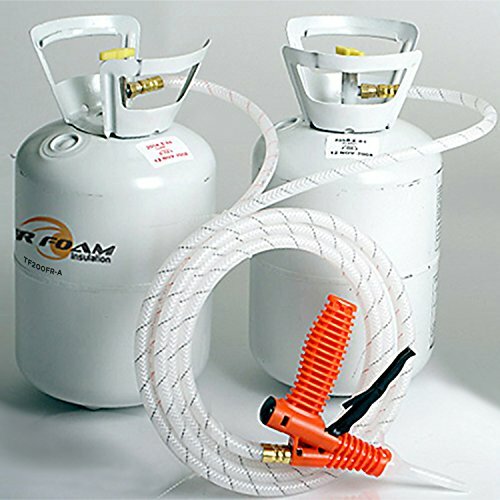 Spray foam is an excellent insulator that brings many benefits when employed in the home. Saves energy - By insulating the walls and ceilings, spray foam means less heat loss. This keeps our houses warm and negates the need for such high and frequent heating, saving both energy and money. In fact, foam insulation can cut back energy loss by 30-50%. Helps with allergies - As the foam helps to seal up cracks, it stops pollen and dust entering your home. This helps to reduce asthma attacks and other allergies. Less mold - As the air is less damp, this means the chances of mold entering the home are lower. By sealing up any gaps, spores can’t enter the home, and damp, cold air can’t settle. It is durable - Spray foam doesn’t sag or settle, so will retain its insulation over the years. In comparison to window film that often falls off, this type of insulation has a long lifespan. Prevents freeze damage - External walls freezing can cause issues to pipes inside them. Insulation of this kind helps to stop the temperature from dropping too low, helping to prevent burst pipes. It can soundproof the room -Some spray foams can work to block out sound, as well as keep in heat. This keeps your neighbors from disturbing your peace. Whether you are looking to improve the heat efficiency of your home or trap cool air in the summer, insulation is the best way to go. Have a look at these spray foam insulation products to see what you might be looking for and find one that suits you. 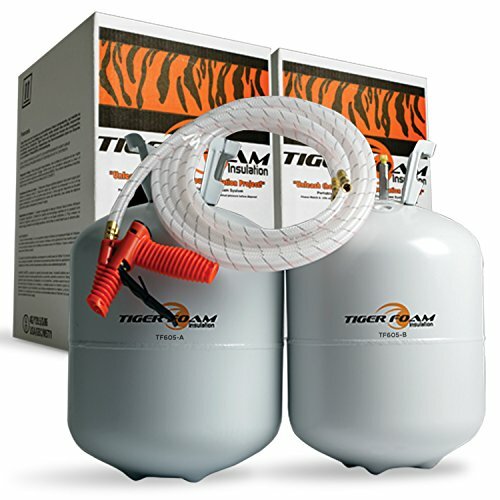 This is a closed-cell foam insulation product, with disposable and recyclable tanks for easy disposal after use. This product covers 600 board feet one-inch thick and comes with a 15-foot gun and hose, six fan nozzle tips, and four cone nozzle tips. The different nozzles allow this to be applied easily but be careful not to squeeze the trigger too hard. It dries fast, making this a quick solution to your insulation needs. You can lubricate the nozzles with vaseline. This two-part kit comes with a tank for each chemical. It has a 30-foot hose, gun dispenser, and 12 nozzles, both coned and fanned. There is a lubricating jelly packet and a wrench included with this kit. While unfortunately, the tanks are not recyclable, this insulation covers a large area and works well. Designed for easy application, this model includes technology to stop nozzles from becoming blocked while in use. 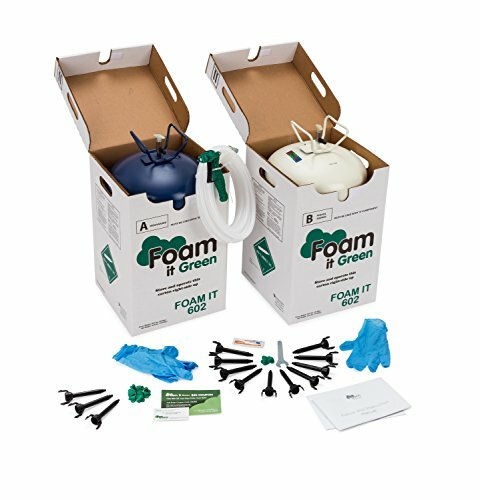 Another two-part kit, this foam insulation can be used to fill cavities as well as seal to prevent air loss. It has a great energy efficiency rating and can yield up to 650 board feet with a 1.75-inch foam density. It comes with hose, gun, and nozzles. This model is effective at sealing cracks and retaining heat, but can be a little temperamental in regards to even delivery of each chemical. This kit covers a large area and is easy to apply. Designed for first-time users, this product is fire retardant and seals out air while insulating. It is mold and pest resistant and comes with 17 accessories including gloves, nozzles, and goggles. Foam Comes with Varying Sized Nozzles for Easier Application. Designed for first time users, this is easy to apply if you follow the directions for an easier application. It is a little drippy but comes with gloves and goggles to protect your skin and eyes. This closed-cell insulation foam is quick rising, filling cracks and gaps quickly. It comes with a 9.5-foot hose, a gun, and eight nozzles. It can cover 200 board feet of space, at one inch thick. Though the gun is a little hard to use, once you get the hang of it, this insulation kit operates smoothly operating. The nozzles are great quality, the product dries fast, and expands quickly. This closed-cell spray insulation foam is quick drying and easy to apply. It comes with disposable, recyclable tanks, and includes eight nozzles, a 9.5-foot hose, and an application gun. It can cover 200 board feet one-inch thick. While this is a great, eco-friendly solution, it is hard to return if unsuitable. It is easy to use, however, and is a good product for small applications. Insulating your home is extremely important if you want to save costs on high energy bills during the colder months. Not only does the spray foam help to keep heat in, but it also saves on air conditioning bills as cold air is retained throughout the house. Remember to choose wisely between closed and open-cell spray foam, especially if you have soundproofing needs. Either way, adding spray foam can help to cut heat loss by half in your home. Saving considerable money on bills means more money in your pocket.